Mimio has released new versions of three of its interactive learning tools: MimioStudio, MimioMobile, and MimioCapture Ink Recorder. 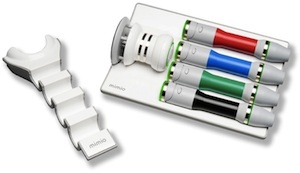 MimioCapture with magnetic pen holder. MimioStudio is a system designed for creating and delivering interactive lessons in classroom settings. The new MimioStudio 11 has added new question type support for Common Core assessments for students using MimioMobile on their mobile devices, including open response, numeric, and short essay. The software will also automatically grade those question types. Support for third-party content libraries. MimioMobile is a mobile tool that allows students to collaborate on interactive whiteboards. MimioMobile 2 expands device support onto Android phones and tablets and all iOS devices (running iOS 4 and up). Mimio has also released an update to MimioCapture Ink Recorder, a tool that allows teachers to record input on MimioTeach and MimioBoard interactive whiteboards using up to four dry erase Expo pens. MimioCapture saves input in color to the teacher's computer. The new version includes a portable desktop charger for the pens and eraser, along with a magnetic pen and eraser holder. All of the new tools are available now. Further details can be found on Mimio's site.